This year, instead of making resolutions for the year, I decided to make monthly goals instead. I will be sharing five goals each month that I'd like to work on. Each month I will also reflect on how I did with the previous month's goals. My niece is turning 8 this month and will be baptized into the LDS church. It's a huge deal in their religion. We will be attending the baptism and the party afterwards. My sister-in-law asked if I would put together a little slideshow to play while she is getting changed (after the actual baptism). My niece was born 7 weeks early and many of their current friends don't know her full story or how little she actually was. I was getting super emotional going through the photos on my hard drive, picking which ones to include. I can't believe it's the same little girl who's turning 8! I mentioned a week ago that I'm considering photographing and sharing my daily outfits. I'm always curious as to what other moms are wearing, but I also think it will help me. I think it will encourage me to dress better on a daily basis as well as wear more of my closet instead of just sticking with the same pieces. We haven't gone on a date just the two of us since our anniversary (at the end of August). It's about time we went out again, and we have a few gift cards to nice restaurants just burning a hole in our pocket! Yes, it's only November, but if I don't start now Christmas will arrive and I won't be prepared. I consider Christmas to be the entire month of December and I have so many ideas of what I want to do to make it super fun! I want to come up with a decorating game plan, plan our advent calendar and activities, and start brainstorming gift ideas for friends and families. We've really lucked out with weather this month and I think we accomplished this goal. Like I said, Noah goes outside at school and then we try to get out as much as we can on the weekends. In addition, we went to the zoo twice, went on a nature walk, watered flowers, and simply played outside. It felt great and I'd like to keep it up! Looking back, I don't know why I had this as a goal for October. 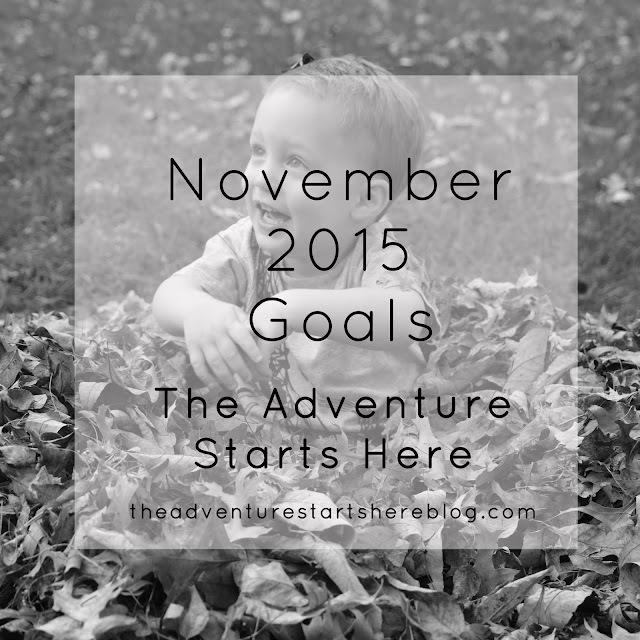 Instead, I added it again as a November goal. I decided it would make more sense to see what he got for his 3rd birthday before figuring out what we will keep versus donating and how to store it all. That's so sweet of you to make a slideshow for your niece! It can always be super emotional going through family baby photos. Time flies by so fast! Oh I am already planning for Christmas too! I'm going to try and do my shopping while Liam is in school, so I need to start now, ha!